A former first lady of the Philippines and current congresswoman has been found guilty on 7 counts of corruption. 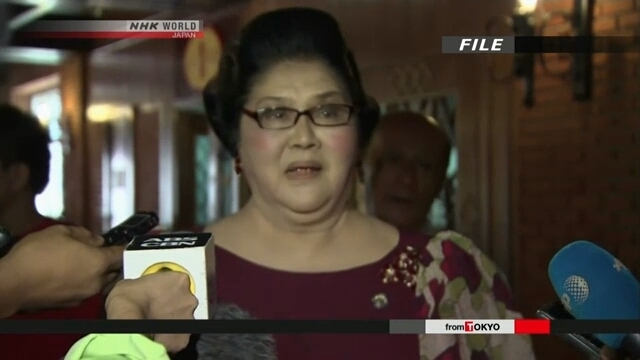 An arrest warrant has been issued for Imelda Marcos. The 89-year-old did not attend the court hearing and has yet to issue a response. Marcos was found guilty of illegally funneling about 200 million dollars to Swiss foundations in the 1970s and 80s. She was sentenced to 6 to 11 years in prison for each count. A court prosecutor says she might be able to avoid jail time if she appeals. Marcos has served 3 terms in Congress. She is also registered to run in an election next year to succeed her daughter as governor in a northern Philippine province. Marcos became famous for a huge collection of shoes, jewelry and artwork after her husband and former dictator Ferdinand Marcos was ousted in 1986 in what was known as the ”people power” revolution. She was able to make a political comeback but has also faced a number of other corruption cases. She was convicted in the 90s but later cleared by the Supreme Court.